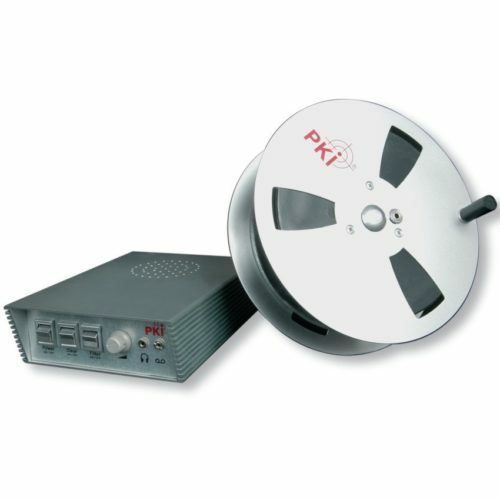 The PKI 2950 especially was developed for wired room monitoring applications. Due To its cable-based operation this unit is not detectable by any counter measure equipment. The subminiature electret microphone with its small dimensions and the small diameter of the shielded cable is ideally suitable to be hidden behind wallpapers, curtains or in window frames. The small dimensions of the microphone prevent from detection by measuring equipment based on analysing the non-linear junction effect generated in semiconductors. The complete system consists of the highly sensitive electret microphone with shielded connection cable, a cable reel with output socket, headphones and the separate audio amplifier. The supplied audio amplifier provides a low-noise amplification adjusted to the subminiature electret microphone of this system together with a 5 band graphic equaliser and every necessary output for direct listening or recording of conversations. Features like direct listening with headphones, a socket for recording devices and the possibility to extend the total cable length by driving different reels in cascade, fulfill all requirements for effective surveillance.